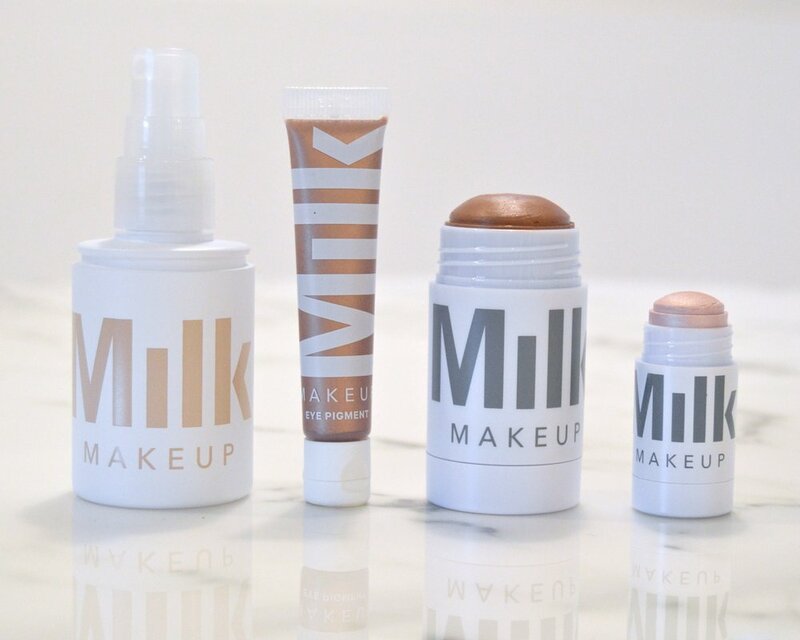 Over the past few months I have become an absolute Milk Makeup fangirl. Everything I try, I love. First it was the cheek and lip stain, then it was the lip balm, and now I have a little menagerie of Milk products that I just love. The blush and lip balm have gotten their own dedicated posts, but I wanted to mention these other products I love (and they all happen to be color coordinated). Blur Spray: I’m making a point to use setting spray every day I wear makeup, especially now that I’ve stopped using powder. I’ll be honest, i bought this spray because I’m now a Milk Makeup addict, and it was half off. It’s not as good as Urban Decay All Nighter (my fave), but it’s alright! Eye Pigment in Gig: This color isn’t available anymore at Sephora, but you can still get it at the Milk Makeup site for half off. I mentioned in Wear, Watch, Want #94 that I wanted to try out this product as a potential replacement for Maybelline Color Tattoo shadows. The tube IS an improvement, but this product is worth the $12 I paid for it, but for $24 (the full price) I want a larger selection of neutrals. But if you want a bold color that will stay put for a literal eternity, this is the one for you. The color payoff on these pigments is really impressive, and they stay put FOREVER. Matte Bronzer in Baked: I am not a regular bronzer user. I am super pale and I choose to just lean into that. But I occasionally like to do a very (VERY) slight contour, and this bronzer is matte, which means you can cheat and use it as a contour. I do a swipe under each of my cheekbone and maybe on my jawline, then blend with a Sigma Round Kabuki Brush. This bronzer is great because the matte finish makes it versatile, and it comes in two shades so you can adjust based on your skin tone or personal preference. Highlighter (Mini) in Turnt: Just like I’m not a regular bronzer user, I’m also not a regular highlighter either. But those little sticks of product from Milk are so appealing! I couldn’t resist, so I got a tiny tube of Turnt (it doesn’t come in a large size?!) and it’s okay! I don’t reach for it every day, but now that I’m less into a super matte look and am more open to a little dewiness, this is nice to have. I spoke with a Sephora Cast Member (that’s what they’re called, FYI. Just like Disney), and she told me that the reason some Milk Makeup products are half off is because Milk is going to be introducing more products soon. Milk I AM READY.